Unique Design – Secure magnetic seal floating locket with 24 pcs (2 sets ) birthstone crystal, the tree of life, the Double shiny rhinestones surface, Engraved 'I love you to the moon and back' on the back of memory locket. Perfect for Gift Giving – The family tree of life birthstone design, symbolizes the cycle of life, which represents the love and connection between our families and ourselves. Perfect gifts on mother's day! Birthday necklace gifts for all important family person. 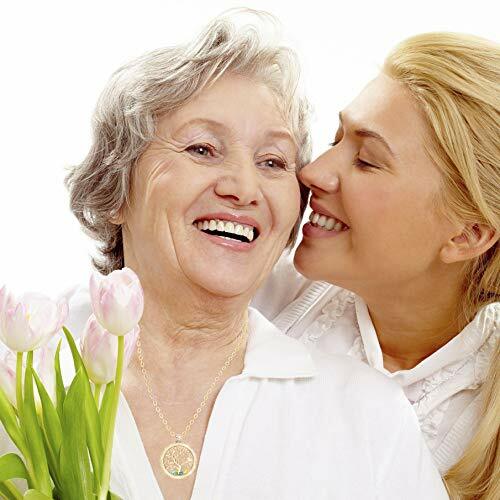 It is a special gift for your mom, grandma, mother-in-law, daughter, wife or nana. 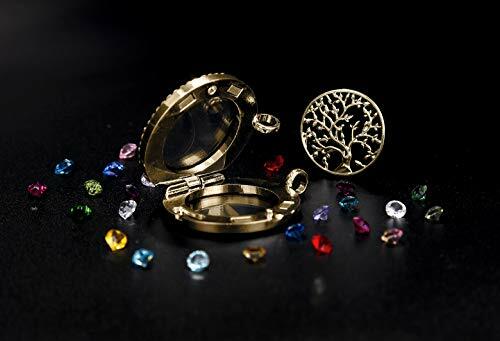 Easy to Open the Locket – This glass locket opens from the side like a book, Easy to open/ closure, and has a very strong magnetic, so you don't have to ever worry about losing any of your birthstones. This also allows you to be able to open it up and add more charms, or switch out the pieces for a DIY new look each day! 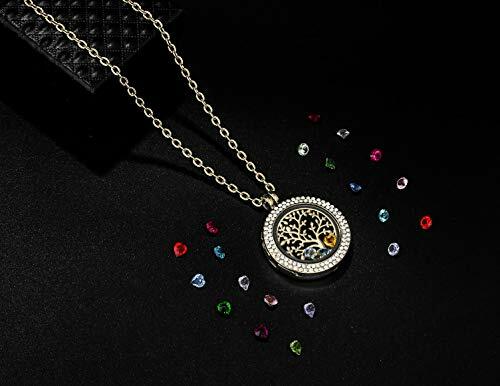 Our women's charm necklace features a dual-face design with rhinestones on one side and featuring word ' I love you to the moon and back ' on the other. 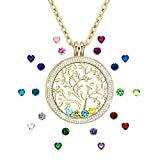 What's more, you can open up the locket easy and add your own charms, initials, or memorabilia. Perfect gifts on mother's day! 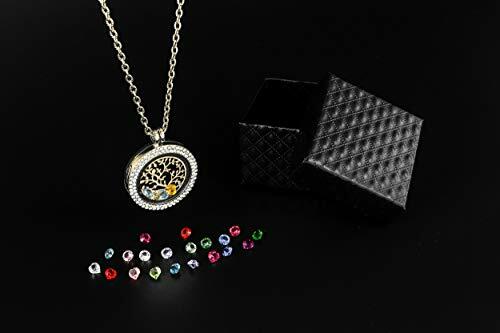 Birthday necklace gifts for all important family person. 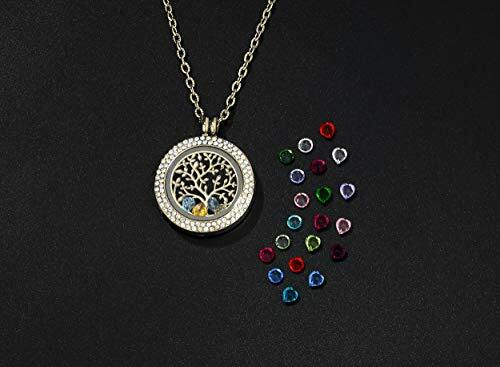 Wonderful Christmas gift , This floating charm necklace is a special gift for your mom, grandma, mother-in-law, daughter, wife or nana. Let someone know how much you love them with this beautiful necklace. How to Open the Locket? 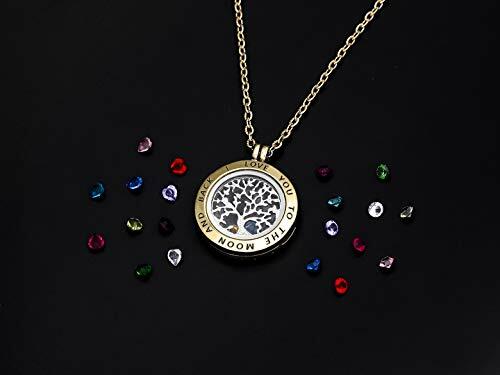 The family tree of life necklace opens like a book with a hinge on one side and a magnet on the other. It can be opened just with your fingernails, and seems strong enough to stay closed during regular activity. How Many Birthstones Come With the Order? Will this Chain Tarnish, or Turn Green? This chain Made of Alloy, 100% Handmade , Lead Free, Nickel Free Eco-friend Alloy, It will never fade and is not allergy for your skin, suitable for sensitive skins, no harm to health. We strives to provide good item and service for all our customers, If you receive a broken item or have any questions, please be free to contact us, we will free replacement a new one or full refund to you . We offer a 100% satisfaction guarantee because customer first.